The complete Fabric Sofa Collection by Forest Sofa is available at Harvest Moon, your Forest Sofa stockist. 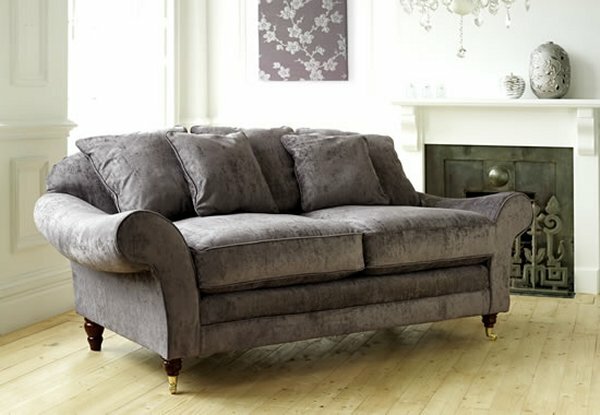 A unique collection of fabric sofas, fabric sofa beds and fabric chairs all handcrafted right here in the UK with a short lead time of only 4-8 weeks. The 12 sofa models in the Fabric Sofa Collection by Forest Sofa are as follows: The Ashbourne, Bronx, Chester, Heather, Latino, Liberty, Lincoln, Mayfair, Miami, Rico, Royal and Warwick and they can all be found below. Each piece in the Fabric collection has been uniquely created by leading interior design houses. A variety of fabrics have been selected from sumptuous deep velvets and damasks, to stylish elegant chenilles and linens. The image above shows the Royal fabric sofa in Floral Mantra Black. The designs include the classic Royal sofa plus a selection of contemporary fabric sofas in a wide range of half sizes from 1 and a 1/2 love seat sofas right through to 4 seater sofas to fit in all room sizes. Many of the models are also available as an armchair and as a regular or large sofa bed. The Forest fabric sofa beds are manufactured with a solid metal two fold frame and a combination of wooden slats and webbings, making the sofa bed suitable for everyday use. A 12cm sprung mattress comes as standard, but air or memory foam mattresses are optionally available. Should you wish to visit us in person in sunny Southport we have some pieces of Forest Sofa furniture on display including the Royal sofa. Directions and map. We can also arrange an appointment for you to visit the Forest Sofa showrooms in Manchester to view the whole range if you wish. FREE delivery on all FOREST SOFA orders to UK mainland addresses at Harvest Moon! The Forest Miami sofa is a opulent and grand fabric sofa with award winning Duratec interiors and loose scatter back cushions. 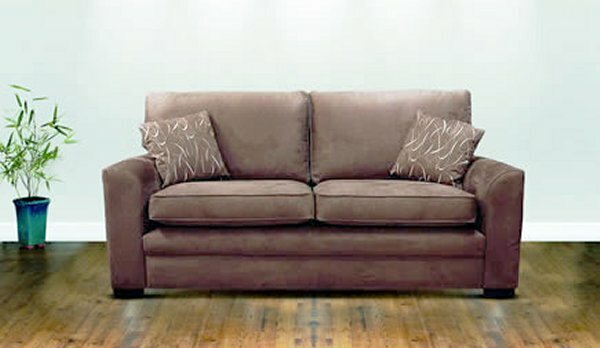 Sit down or fall into this fantastic sofa and leave the world behind as you relax in true comfort. The Forest Miami 3 seater fabric sofa is shown below in Vivaldi fabric. If you like the Miami sofa, sofa bed and chair design but would rather have it in Premium leather click here. The best selling leather sofa the Bronx is now available as a fabric sofa as well and can be seen in ROMO Leono Porridge fabric below. This is a classic sofa design but with a modern feel to it. The Bronx sofa includes double sided seat and back cushions and teams up well with the Forest Macy stool and Hudson tub chair. If you like the Bronx sofa, sofa bed and chair design but would rather have it in Premium leather click here. The Chester fabric sofa by Forest Sofa is a contemporary fabric sofa which is available in all sizes from a one and a half love seat sofa right up to a large 4 seater sofa with two sofa bed options and also as an armchair. 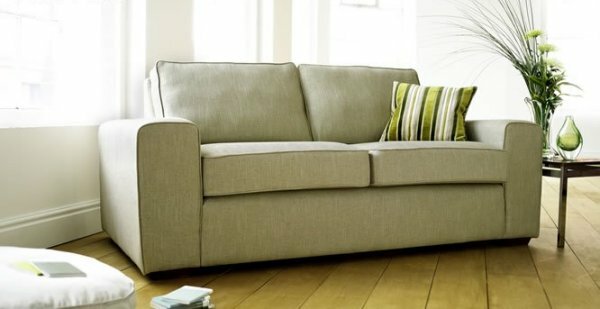 The Chester fabric sofa is available with detachable arms. If you like the Chester but would rather have it in Premium leather click here. 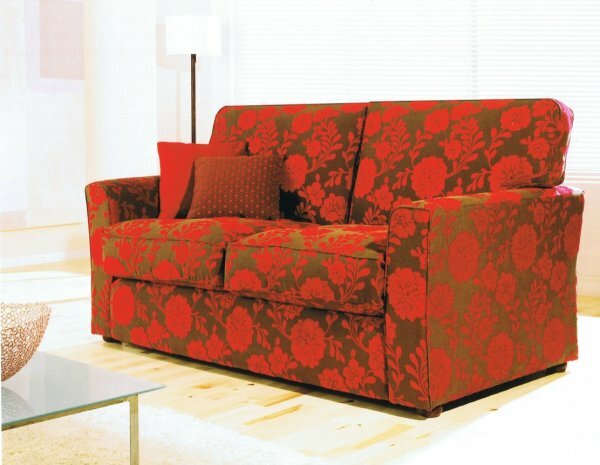 The Forest Lincoln fabric sofa as well can be seen in Viscosity Shiraz fabric with Jupiter Shiraz fabric scatters below. This is a traditional sofa design with tightly scrolled arms and traditional 3 cushion seating. 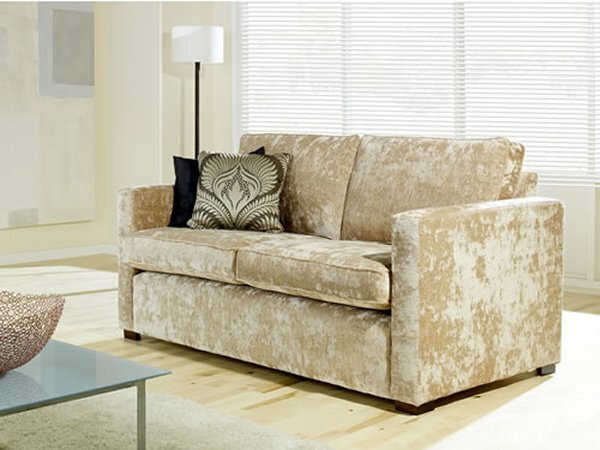 The image below shows the luxurious 3 seater Sofa Collection Heather Fabric Sofa by Forest Sofa in Beige Velvet. 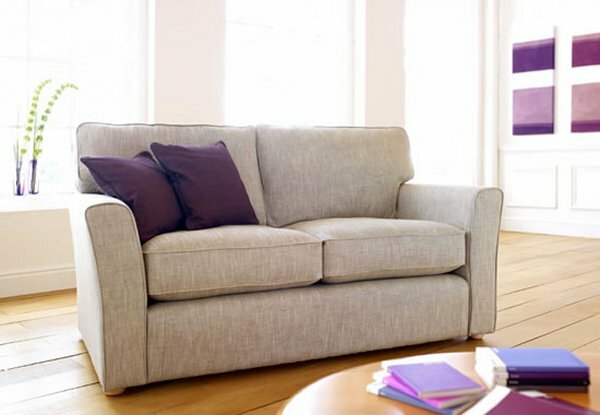 The Heather sofa has a sleek yet compact arm design and is available with detachable arms. LOTS OF CHOICE! 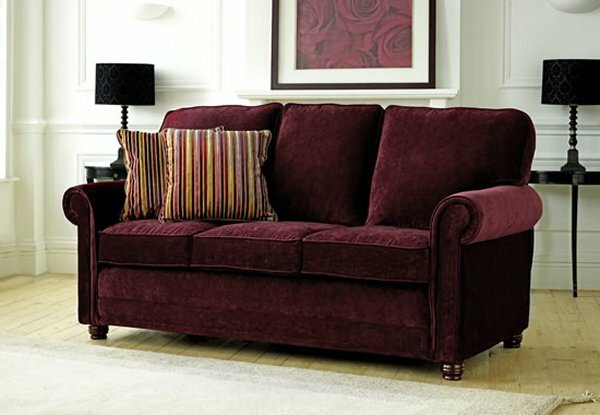 - The Heather sofa is available in over twenty different crushed velvet fabric options for you to choose between. The image below shows the 3 seater Sofa Collection Latino fabric sofa in Mantra Red. Like all the Forest fabric sofas it features Forest's individual coil sprung base and award winning luxury Duratech fibre fill cushions. The Latino is a simple, understated design with clean lines and is available with detachable arms. In contrast the image below shows the Latino sofa ROMO covered in Malmo Linen. If you like the Latino design but would rather have it as a Premium leather sofa, sofa bed or chair click here. The Liberty fabric sofa by Forest Sofa is a contemporary fabric sofa designed with a half curved arm and is one of the best selling Forest Sofa sofas in either fabric or leather. 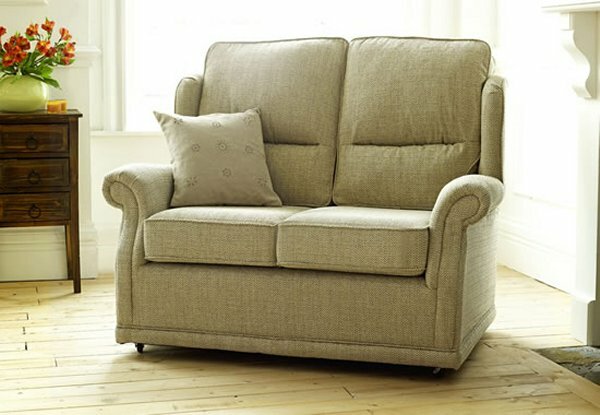 The Liberty is available in all sizes from a one and a half love seat sofa right up to a large 4 seater sofa with two sofa bed options, regular and large and also as an armchair. 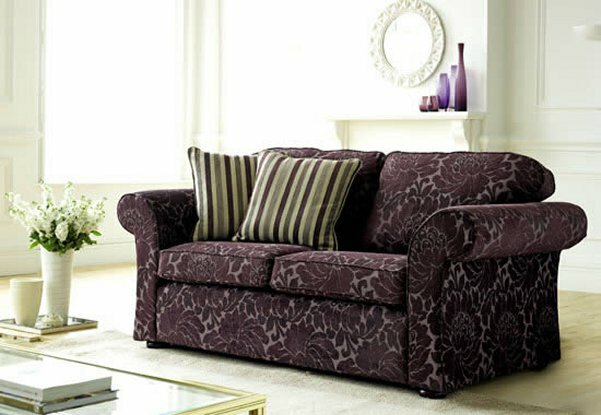 Like the other fabric sofas the Liberty sofa is available with detachable arms. If you like the Liberty design but would rather have it as a Premium leather sofa, sofa bed or chair click here. The image below shows the 3 seater Sofa Collection Mayfair fabric sofa in ROMO Delano Puce. A distinctive solid hardwood plinth and solid arm caps fixed to the upholstery are unique to this design and the polished hardwod is available in a range of colours - Walnut, American Oak or Wenge wood as shown below. The Mayfair sofa is available with detachable arms. The image below shows the luxury designer 3 seater Sofa Collection Rico Fabric Sofa in Romo Melton Clay fabric. The Rico is a bold contemporary sofa design, with a superior coil sprung seating platform and luxurious deep fill seat interiors and is available with detachable arms. If you like the Rico design but would rather have it as a Premium leather sofa, sofa bed or chair click here. 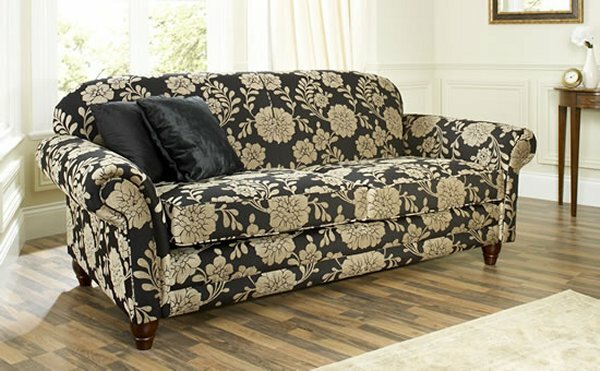 The image below shows the luxury designer 3 seater Sofa Collection Royal Fabric Sofa in a Floral Mantra Black fabric. The Forest Royal sofa is available with detachable arms, however, some skill is required to fit the arms. 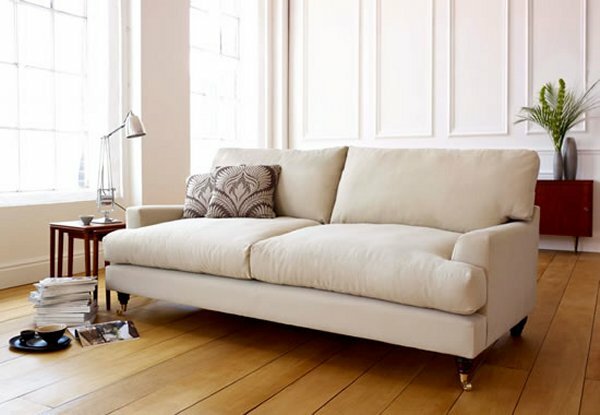 The image below shows the 3.5 seater Sofa Collection Warwick fabric sofa in Mode Natural Linen. 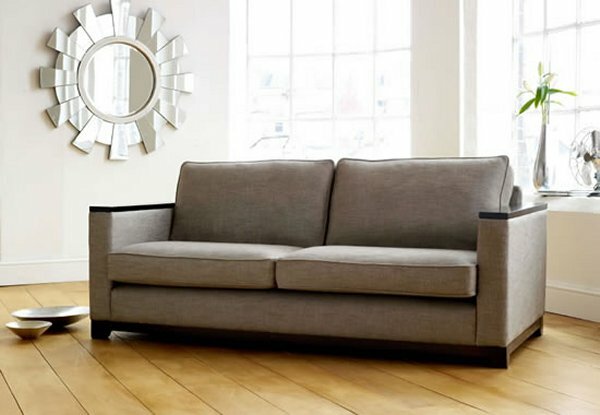 The Warwick sofa is a classically styled somewhat underrated design. Deep fill cushions create a luxurious feel with hand crafted walnut finished feet completing the look. 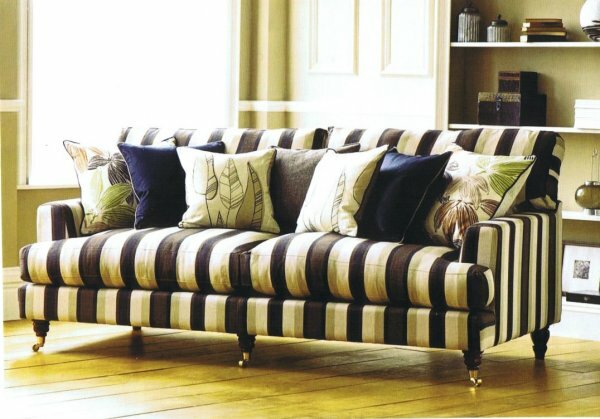 Choose from over 80 available fabrics for your Warwick sofa! 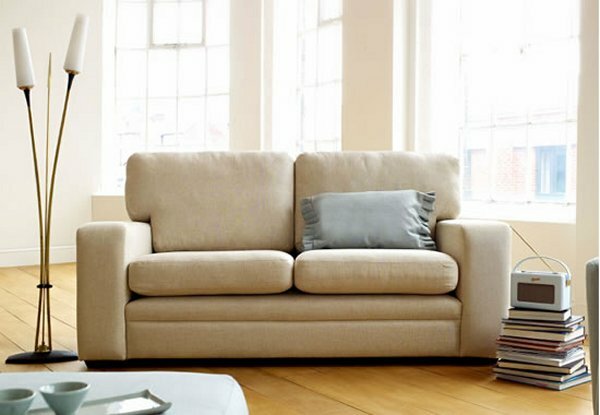 The Warwick fabric sofa is available with detachable arms. The 3.5 seater Sofa Collection Warwick fabric sofa can also be seen below in a new stripe fabric in the image below for a very different look to that shown above. The Forest Ashbourne fabric sofa can be seen in Oslo Vienna fabric below. This is a traditional compact and neat design. Supporting lumbers provide a comfortable sit and castors allow for easy manoeuvring around the home.